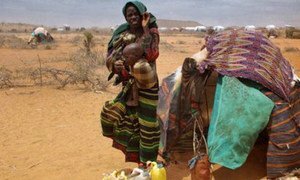 UNICEF said in an update to the media that the supplies were delivered to Baidoa, a town in the Bay region of south-central Somalia, as part of the agency’s life-saving assistance for drought-affected children. More than half a million children in Somalia are acutely malnourished and in urgent need of humanitarian assistance. Southern Somalia is the most affected area with 80 per cent of all malnourished children living there. The delivered consignment of relief items included five tons of essential nutrition supplies, including therapeutic food and medicines to treat severely malnourished children, and equipment to supply clean water to a camp for displaced persons in Baidoa. “Health supplies are also en route via Mogadishu, consisting of health kits with essential medicines to treat common childhood illnesses, such as respiratory tract infections, diarrhoea, minor injuries and worm infestation. The supplies are sufficient to treat up to 100,000 people over a period of three months,” said Rozanne Chorlton, UNICEF Representative for Somalia. “We are ready to work anywhere in Somalia, provided we get unhindered access to reach the most vulnerable children in need,” she added. Meanwhile, UNICEF Executive Director Anthony Lake, who is visiting Kenya, will at the weekend travel to the north-western district of Turkana, where malnutrition rates have risen dramatically and child mortality rates are above the emergency threshold, the agency’s spokesperson in Geneva, Marixie Mercado, told reporters. UNICEF is working with partners in all drought-affected areas of Kenya to scale up access to nutrition services and treatment, and to expand access to safe drinking water, education and protection. The UN World Health Organization (WHO) said that a poor health care system in drought-affected areas of the Horn of Africa, low immunization coverage, population movements, lack of clean drinking water and poor sanitation have left people vulnerable to communicable diseases. Health priorities included management of severe malnutrition, child illness and maternal health, immunization and waterborne disease control and treatment, according to Tarik Jasarevic, the WHO spokesperson in Geneva. He said that the health sector was under-funded even as the need to scale up emergency health care to sick and severely malnourished children has risen. In Ethiopia, WHO is supporting the training of health workers on the management of severe acute malnutrition and delivering inter-agency emergency health kits to the Government, UN agencies and non-governmental partners, Mr. Jasarevic said. He noted that in Somalia as many as 413,000 children under the age of five would be reached during the ongoing “Child Health Days” in Somaliland. Mothers and children have been receiving polio, measles and tetanus toxoid vaccination, de-worming treatment and nutritional screening. The campaign will be extended to Puntland next week targeting 156,000 children. A measles outbreak has been reported in the drought-affected Kenyan district of Mwingi and in the Dadaab camps that accommodate mainly Somali refugees, according to Mr. Jasarevic. WHO is conducting training for all district health teams and in refugee camps on the integrated disease surveillance and response, as well as emergency preparedness and response, he added. UNICEF and WHO are preparing to launch a vaccination campaign along the Somali-Kenyan border and in the Dadaab refugee camps, Mr. Jasarevic said. Secretary-General Ban Ki-moon today called on countries to urgently support United Nations agencies in their efforts to respond to the crisis in the Horn of Africa, where more than 11 million people are in need of life-saving assistance as they face the worst drought in decades.